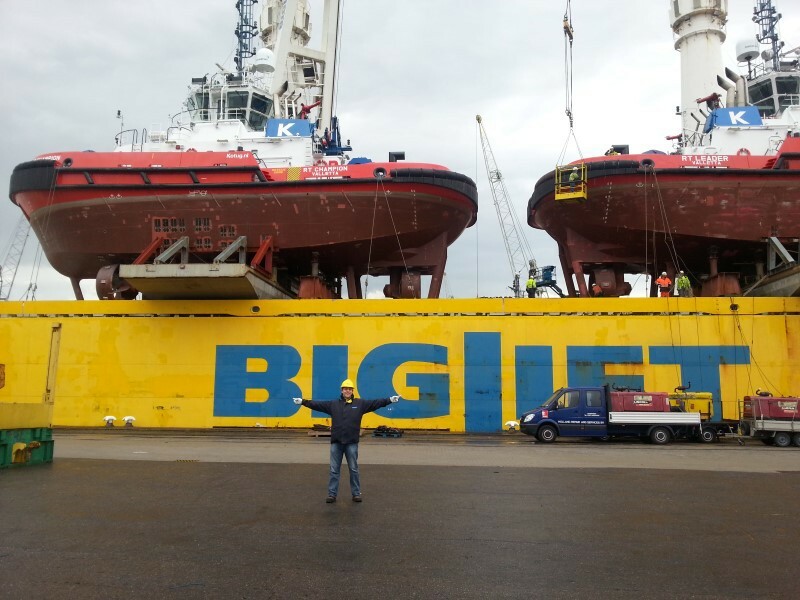 The size of the Rotor Tugs (28x12x15 m) limited the available area on deck. And as they weighed 720 mt each, all three units had to be loaded within the reach of both cranes. Happy Buccaneer’s deck is already an impressive 28.3 m wide. However, standing two boats side by side and adding the necessary space for sea fastening would require a total width of at least 33 m.
The solution was found by placing Happy Buccaneer’s tweendeck covers on deck so that they acted as extended deck area and as the basis for the supporting structure below the central part of each tug. Because of this extra surface, transverse stoppers could be placed at the extreme ends of the tugs. Additional vertical supports were placed between each tug. The engineering, which included loading plans but also materials and supports, was performed in-house. Many of the materials used came from our own stock, but due to the particular shape of the hulls some tailor made pieces were also ordered.